Back in January we heard that Leslie Mann and Paul Rudd would reprise their married characters from Knocked Up for a spin-off film from director Judd Apatow. Though the film still doesn’t have a title, the project is slated to be released on June 1st, 2012, and has a new cast member coming on board the comedy. THR reports Megan Fox (Transformers, Jennifer’s Body) is negotiating to join the film, but her role is being kept under wraps. As for the plot, well that’s not known at this time either, but Apatow has mentioned that the film will follow Rudd and Mann’s characters’ marriage five years after the events in Knocked Up. Since it’s actually been five years since Knocked Up hit theaters, the real-time passing between films pretty much guarantees that Apatow’s kids will still be around (they played Rudd and Mann’s kids in the 2007 film as well). As for Fox’s addition, her acting talents definitely leave something to be desired, but perhaps a comedy like this will let her spread her wings a little bit. It’ll be interesting what kind of role she has in the film too and if she might end up bringing some trouble for the married couple. Only time will tell. 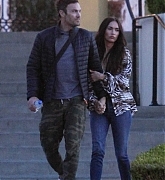 Ringless Megan Fox: Engagement Is “Old News”!